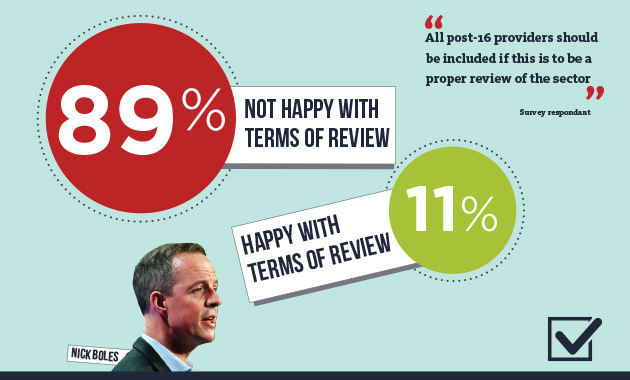 Almost 90 per cent of principals affected by new area reviews are unhappy with government guidance outlining how the process will work, an exclusive FE Week survey has suggested. Huge unease with the Department for Business, Innovation and Skills (BIS) and Department for Education (DfE) guidance was revealed in a survey of the 38 principals of colleges whose future has been put in question by the post-16 education and training reviews. An overwhelming 89 per cent of the respondents, who all chose to remain anonymous, indicated disquiet with the terms of the reviews, which had been leaked to FE Week, answering simply whether they were happy or not with the guidance. Underlying the reviews, covering Birmingham and Solihull, Greater Manchester and Sheffield city region, is the “need” to move towards “fewer, often larger, more resilient and efficient providers,” according to the government. However, one principal answered: “The most significant issue is the exclusion of school sixth forms, university technical colleges (UTCs), free schools and [independent] training providers from the reviews. The government published its guidance, introduced by Skills Minister Nick Boles, on the reviews on September 8, and separately identified 22 general FE colleges and 16 sixth form colleges (SFCs) that will be directly involved — but no schools, UTCs, free schools, or independent learning providers (ILPs). Gripes about their omission featured heavily in the survey responses and mirrored the views already expressed by sector leaders who said that only including general FE colleges and SFCs would paint an incomplete picture of post-16 provision. James Kewin, deputy chief executive of the SFCs’ Association, warned that the process was “fundamentally flawed” while Martin Doel, chief executive of the Association of Colleges, said “all provision in an area” should be considered. And Stewart Segal, chief executive of the Association of Employment and Learning Providers, said the reviews should recognise the “very significant” role of ILPs. A joint BIS and DfE statement released on Tuesday (September 8) stressed that the reviews will focus on the current structure of FE colleges and SFCs, although there will be opportunities for other institutions including schools and independent providers to “opt in”. Regional school commissioners will also “consider the implications” for school sixth form provision, it said. A BIS and DfE spokesperson also told FE Week that the government was separately “reviewing the criteria for the opening of new school sixth forms, because of the risk of oversupply”. The area reviews for Birmingham and Solihull, Greater Manchester, and Sheffield city region will start on September 18, 21 and 28, respectively. Official responses from colleges involved with area reviews indicated widespread caution over how they will be run. She added: “We are working in collaboration with other colleges and organisations to collectively review our curriculum and areas of expertise. “The college is very pleased with current enrolment figures for 2015/16 for both 16-18 and adult students, demonstrating that there’s big demand for FE in south-West Birmingham. It added that all of the colleges “will work with all of the stakeholders to achieve the best possible outcome for FE provision in the region”. “There is an opportunity to increase our contribution to employers by addressing skills gaps and supporting regional economic growth which, in turn, will help to create jobs and careers for our students, and support our local communities,” the colleges said. However, a spokesperson for Birmingham Metropolitan College, which will also be involved with the Birmingham and Solihull area review, was broadly supportive of the process. None of the 10 FE colleges and 11 SFCs that will be taking part in the Greater Manchester area review responded ahead of publication. Click here for a list of all the colleges involved in the reviews. A selection of the comments made by college principals, who wanted to remain anonymous, to the FE Week survey are included below. They were simply asked whether they were happy with the review guidance. The most significant issue is the exclusion of school sixth forms, UTCs, Free Schools and training providers from the reviews. This is not a review of the post-16 sector, but a partial review. It would appear that ‘wasteful duplication’ is acceptable for A-Levels and provision for the most able young people, even to the detriment of quality. The timescales are unrealistic. There is a fundamental tension between the independent status of colleges requiring governing bodies to agree to recommendations and the drive to cut costs. It is also unrealistic that Colleges and local authorities are required to meet the costs of any proposed structural changes. There are recent examples of the extraordinary cost of college closures (e.g. Totton). The exclusion of school sixth forms, unless volunteering for inclusion, means the basis is inherently flawed. Undue haste leading to inconsistency of approach. The fact that a large number of SFA funded organisations are left out so it isn’t an area review in any proper sense. All post-16 providers (school sixth forms, 16-19 free schools, UTCs, etc.) should be included if this is to be a proper review of the sector. Amongst other things, the exclusion of post 16 providers (eg school sixth forms, UTCs, ..) from a review of post 16 education! It is singling out FE cOlleges when we are not the only post 16 providers. It is determined to not impact on UTCs or National Colleges which doesn’t make sense. They return with merger and rationalisation as their key outcomes but history shows that larger merged institutions do not necessarily bring efficiency (Lewisham and Southwark, K College). There are norms proposed such as that Shared Services saves money and that mergers save money. They are not looking at Colleges in the context of their communities. They talk about financial stability when they are unable to provide guaranteed funding for three years (and have even struggled to do 1 this year with late cuts announced). The review of FE Costs they are pointing to is very limited in what it has looked at and clearly doesn’t understand FE. The comparison with NHS Admin costs as a percentage of income is a nonsense – doctors and consultants earn similar amounts to Principals and there are lots of them so of course their admin costs will look lower as a percentage. We are supposed to be opting in but there is a threat of no funding if we don’t. Why is FE being targetted and yet the agenda is to increase the number of schools? Sixth Form Colleges are included however newly designated 16-19 free schools are not included despite having very low student numbers and poor efficiency. In a similar way school sixth forms with low class sizes and poor efficiency at 16-19 are not included. Sixth form colleges offer high quality and a high level of efficiency per £ therefore they should be excluded from this review unless in financial / performance difficulties.